It’s been a relatively quiet week in terms of the whole riot/protest/police cycle we’ve got going on. If you dig beneath the surface, however, tensions are still simmering and “sides” are being taken. There seems to be very little room for middle ground. You’re either with us or against us. It is one thing or the other. Two opposing ideas that cannot coexist. Quite frankly – it pisses me off. This is not an either/or situation. It’s a both/and. This concept should not be so foreign to people; it’s how most of us operate, most of the time. Two seemingly opposing ideas can coexist. But somehow, many people seem to have forgotten that recently. The riots that occurred in Baltimore (or Ferguson or anywhere else) are not okay. They are not the solution. AND also death of Freddie Gray while in police custody is not okay. It is not okay at all. Throwing rocks or bricks – or, frankly, anything – at police officers is not condonable. Neither, however, is it condonable for police to overstep their boundaries and persecute the communities they are bound to protect. Saying that “black lives matter” does not imply that you are, in any way, anti-police. It just doesn’t – no more than saying, “Doritos are delicious” means that you are, in any way, anti-Pringles. You can believe that Doritos are manna from heaven while also thinking that Pringles are pretty dope. That should go without saying. Yes, of course police lives matter and white lives matter and all lives matter. But here’s the thing: those statements are basically givens. They’re obvious, omni-present, so we don’t need to continue saying them. Our black and brown citizens, though? Their lives have never mattered as much as non-black or brown lives. And so reminders are needed. We have long recognized this in our society: that we need to celebrate and specially acknowledge the minority, the underdog, the marginalized. When Gonzaga first showed up on everyone’s radar in 1999, they were deemed a “Cinderella story.” Everyone was rooting for them. But while people cheered the Zags on, how many folks were on the sidelines saying, “But what about UConn?? Where are the UConn posters? UConn matters, too!” Because UConn was ubiquitous. Everyone knew them already. They didn’t need the extra support. Or what about St. Patrick’s Day, when parades are held and people proudly tout their Irish heritage and cities dye rivers green? Do we stomp our feet with indignation that America is not being celebrated, too? “Hey, you guys! We live in the UNITED STATES. Happy St. Patrick’s Day? What about Happy America Day? When you raise that Guinness, you’re basically saying that you hate Americans.” No, of course not. Because we already know that America matters, too. We don’t need a reminder; the Irish can have their day. Or, if you’d rather not do that, perhaps you could ask yourself (if you’re white, or at least non-black or non-brown). Ask yourself when the last time was that you worried that you’d be pulled over by the police while driving through your neighborhood. Ask yourself how often you’ve been walking your dog near your home and have been stopped and asked what you were doing there. Ask yourself if you’ve given your children (especially your sons) “the talk” — not about the birds and the bees, but you know, the one about moving slowly around authority figures, about making sure their hands don’t drift too near their pockets, about keeping both hands on the wheel at all times if they’re pulled over (for God’s sake, don’t reach into the glovebox unless you’re told to) — to help ensure that law enforcement officers have no reason to suspect them of a crime. I would imagine, if you really asked, and then if you really, truly considered the answers, that you would see – even in this glorious America where everyone can succeed if they only try hard enough, where we have a black President, and where Oprah is the queen – that black and brown folks are still not treated the same as white folks. And so, sometimes, we need to be reminded that black lives matter. Did you know that even black dogs are adopted less frequently and euthanized more often than non-black dogs? CRAZINESS, you guys! Yes, I know that dogs and people are not the same. I’m not making a direct comparison. But none of my other photos seemed appropriate… so here you go. 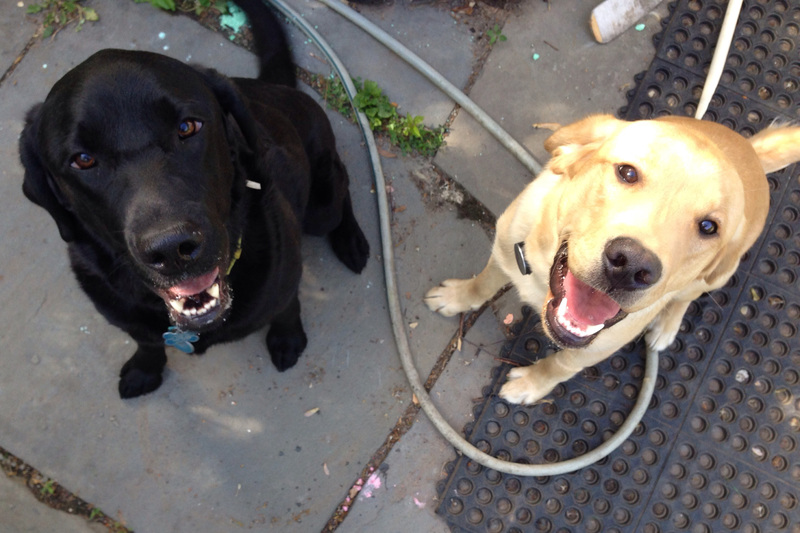 Our black and yellow Labs, both of whom are awesome. But we aren’t asking those questions. Or, if we are, we are jumping immediately to answers without really, really thinking about them; so often, the conclusion is drawn that race doesn’t play a role in how we treat one another. And that, really, is what bothers me the most: we don’t even acknowledge it. We, as an American society as a whole, do not acknowledge that racism still exists — I’m not talking about the overt, name-calling kind (although that exists, too), but rather the systemic, deeply-rooted, unconscious, so-pervasive-we-don’t-even-realize-it’s-happening racism. I am going to ask, for a moment, that you ignore the riots**. I’m not saying that they aren’t horrible – they are. I’m not saying that they’re good or okay – they’re not. (Which is a rather absurd notion, anyway. Have you really come across people saying, “YAY, RIOTS!!”?) But people get all hung up on the riots (which are shown non-stop by our media), which causes them to miss the bigger picture. For me, the bigger picture starts with the protests. Tens of thousands of citizens have been peacefully protesting for years now; the protests are growing ever more frequent. There must be a reason for this. When we look to find that reason, however, there is almost immediately name calling and criticizing. I’ve heard some folks gripe that these protestors “have nothing better to do” – but that’s just untrue. Sure, some are unemployed. Some are looking to simply entertain themselves. But the majority are not. Protests – not the ones that last 30 minutes outside of your local Starbucks, but the ones that take hours and days and are focused and targeted – are not usually what one would consider “fun.” They take people away from their jobs, their homes, their families. So, then. Why? Why the protests? Have you ever had something to say and no one would listen to you? Maybe you were in a large group and couldn’t get a word in edgewise. Maybe everyone else was dead set on seeing Age of Ultron but you had your heart set on Pitch Perfect 2; in their excitement, they didn’t hear you. Maybe it was a meeting and no one asked for your ideas even though you had plenty. Whatever the situation, I think you’d acknowledge that it feels crappy when no one’s listening. Sometimes, you sit back and just let things happen; there’s always next time. Others, maybe you email your boss or try to pull someone aside and explain your thoughts. But what if that doesn’t work? What if it happens over and over again? What if you feel ignored, unheard, shushed? What if you just can’t stand being unseen and unnoticed one minute longer? You yell. You shout. You make noise. You stand up. You do whatever it takes to get people to hear you. It’s very simple, really. That, to me, is the reason behind these protests. People are not being heard and they are sick of it. Yes, they want change. They want to be treated differently, fairly, better. They want justice. But at their core, they want someone to listen to them, by God. And then, when they finally begin to raise their voices, we “listen”… and then immediately discount what they’re saying. Racism doesn’t exist anymore; stop complaining. Not all police are bad; stop generalizing. White lives matter too. Stop playing the race card. If he hadn’t tried to run, the cop wouldn’t have pulled his gun. When you dress like a thug, you’re asking for trouble. I don’t even see color. Their concerns are summarily dismissed – there’s nothing more to see here. Which leads to people speaking even more loudly and strongly because they are still not being heard. Until we can even agree on a topic, we cannot have a conversation. Which is a problem, because holy sh*t, y’all, we need to have a conversation. We need to talk about racism in this country because make no mistake about it: racism still exists. We are all, almost without exception, racist. Yep, that includes black people. It includes teachers and scholars and human rights activists and historians and preachers. It includes me. I try very, very hard not to allow skin color to inform my opinions of people. When I think rationally about it, I know – I believe, to my core – that white people are absolutely no better, smarter, harder working, or more deserving of respect that our non-white brothers and sisters. And yet… I still make assumptions. I feel the worry creep in. Not consciously, not on purpose. But it happens. Until we can acknowledge this – until we can accept that racism is inextricably woven into the fabric of our nation, and until we can accept that non-white people still feel its sting despite our so-called “post-racial” era – things are not going to change. Men of color will continue being funneled into prisons. There will still be a wage gap between minorities and white folks. People will describe themselves as “colorblind” and pat themselves on the back for reading Maya Angelou and watching “Blackish.” Fewer black and brown citizens will attend college than their white counterparts. Police will continue to disproportionately arrest, detain, imprison, or even shoot people of color. Retaliatory shootings will continue to occur. The protests (and, occasionally, riots) will go on. And on. And on. I’ll be honest with you: I have no idea how to fix this. We’ve been (mostly) trying for hundreds of years and we’re still not there, so obviously it’s a pretty tricky issue. But I do know that we don’t stand a chance at fixing it until we’re honest with ourselves that racism exists – all over, pretty much all the time. Once we can do that – once we’re all on the same page, or at least in the same book – we can start a meaningful dialogue on how to make it better. It’s going to take all of us to make this change, but it’s one of the most important journeys we’ll ever embark upon. So, for today, I’ll start with me. My name is Emily. I believe that police have a tremendously difficult job and I have deep respect for our officers. I also believe that black lives matter. Both/and. I believe that riots are absolutely not the answer. I also believe that the current protests are meaningful and valid. Both/and. I believe that everyone should be treated equally, regardless of skin color. I’m also racist. Both/and. I’d like that to change. Let’s talk. Let’s listen. Let’s do this. This entry was posted in thinking and talking, typical crazy and tagged black lives matter, change, family, parenthood, race, racism by missemtoo. Bookmark the permalink. Just got around to reading this, Em, and wanted to thank you for it. There needs to be a little bit of hard truth injected into this conversation and I appreciate your doing it.